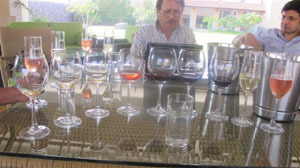 Nashik-based Zampa Wines seems to have zoomed ahead, at least in term of quality during the last couple of years, helped by the arrival of the new winemaker Nick Van Aarde from South Africa, with remarkable change noticed in the Rosé and Rose Brut, writes Subhash Arora who visited the winery recently and tasted the complete range. Nicolas (Nick) Van Aarde, the chief wine maker from Cape Town, comes from South Africa, the country presided by President Zuma who visited India last year. He joined the winery in September 2009 as a consultant winemaker and visits frequently; three months at the harvest time and 3-4 times during the rest of the year for winemaking. He is a viticulturist and enologist from Stellenbosch in South Africa, where he did four years of college. It would be unfair to assume that he alone is instrumental in improving the quality of wines when the previous Australian winemaker Paul Bailey could not, as Zampa wines were first introduced in 2008. After going through the initial period of rather listless wines as an infant, there has been a definite improvement in the quality and their Rosé Brut can claim to be one of the best (and expensive) in the category in India. ‘We will do anything to make sure we offer the best quality wines from India,’ says Neeraj Deora, one of the promoter- Directors; Deepak Roy and Ravi Jain are the other two. ‘We have selected vineyards on the slopes to give us the best possible fruit,’ he adds. A surprise was the Rosé which seemed to be totally different from what one tasted a couple of years ago. Quite perfumed, full of strawberry flavours, this juicy wine is very crisp, clean and remarkably fresh. Nick says he has purposefully kept the level of sugar a bit higher as he feels a Rosé needs to be slightly sweet. It has 11gms/liter residual sugar but the high acidity balances the sugar, making it taste fruity, pleasant and easy on the palate. ‘It’s also perhaps the reason why it is slightly short at the end, though otherwise quite well integrated,’ he explains. 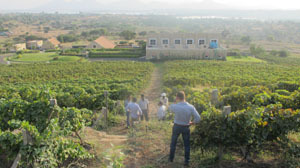 Zampa (the company is named Valley de Vin) owns about 12 acres of vineyard land on a hilly portion, near Sanjegaon village, about 30 kms short of Nashik. 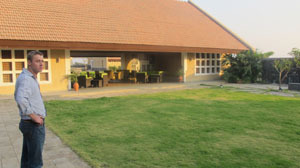 The winery and the vineyards are located with a beautiful view of the distant man-made lake and a silhouette of the beautiful Sahyadri mountain range. The company has been experimenting with different grape varietal plantings. Viognier is already being used in the blends while Tempranillo and Grenache are ready to be harvested in a few days. 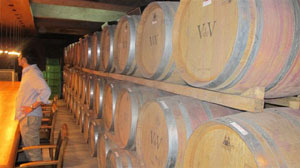 Shiraz is already in the barrels getting ready to be released in the Reserve Range. Crops for this vintage are already being harvested. Nick does not mind sharing that a lot of work needs to be done in the vineyards. He admits that sometimes it is not possible to make totally clean wines due to the local equipment not being able to do the job right. He also rues the lack of controls and wine regulations. The company works on lower yields though, according to him. ‘Tonnage is very low at 2 -3.5 tons from our vineyards while the limit is 3.5 tons from the contracted farmers. We must avoid green tannins and so we look for phenolic ripeness. We drop any bunches with incomplete veraison,’ claims Van Aarde. The barrel room with oak barrels of size 500L, 300L and the 225L barriques is undergoing a continuous change with a major shift to French and some American barrels-all of 225L size, according to Nick. Zampa wines sell for around Rs.570 for whites and Rs. 600 for reds in Delhi with the prices being Rs. 600 white and Rs. 660 for reds in Mumbai- slightly higher than the bench-marked Sula. To compete against the leader, a slightly lower -ended ‘One Tree Hill’ red and white, named after the lone mango tree on top of the hill as visible from the winery, is priced in Mumbai at Rs.500-525. Brut is priced at a very competitive Rs.600 in Delhi but higher at Rs. 790 in Mumbai. Hi Subhash - Not sure when I "vehemently contested" anything... lots of statistics out there and the true figure is anyone's guess..